Mr. Ziggie Zardus has been in the retail music business in Phoenix for over fifty years. This very kind and gentle 78-year-old man has dealt with many celebrities over the years, but claims his friendship with DUANE EDDY is the hallmark of his long career. Ziggie is the man who sold Duane the now-famous sunburst Gretsch Guitar...the one used on most of his hits. 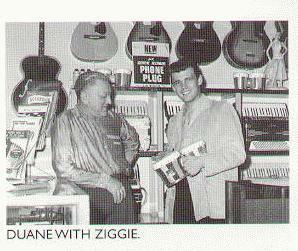 On April 6th, I spoke with Ziggie in a small studio in his music store. DA: How did you happen to meet Duane? ZZ: He just walked in the store...that was about twenty-five years ago. He was just a kid then. He used to come in and admire the Gretsch Guitars, especially the Chet Atkins model. He was gettin' a few jobs at some local clubs, and he come in and buy strings and admire the Gretsch. One day he asked if he could play it, and I said sure. Pretty soon he got in touch with his parents -- they lived in Coolidge then -- and asked them to co-sign the contract. He was underage. They said okay, and he bought the Gretsch. Before that, all he had was an old standard Harmony. DA: Do you still have the contract on file? I'd like to have a copy of it as a collector's item. ZZ: I looked for it this morning for you, but I must've thrown it out. God, if I didn't throw them out, I'd have a room full of 'em! DA: Were Duane's Mother and Dad apprehensive about his entering show biz? ZZ: No, they were very happy he wanted to play guitar. I talked to him on the phone and they said to send down the contract and they'd sign it. Duane still has that guitar. It's got rare pick-ups, and people have offered to buy it, but he won't let it go. DA: What did he pay for it? ZZ: It was in the neighborhood of $400. Now, of course, it'd be worth $900, there abouts. The particular one Duane's got, though, is priceless! After awhile Duane got pretty well known with hit records and left town for California, but everytime he got back to town he'd come and see me, and if I had something rare in an instrument, he'd buy it...and pay cash! ZZ: One time I had a Gibson Mandolin, so I said to myself, "I know just the guy who'd want this," and I put it away. 'Bout six months later Duane comes in and says, "what's new?" When I told him about the mandolin and that I didn't show it to anyone else, he took one look at it and said, "I'll buy it." No matter what the price, he paid right on line. He's always been that way! One time Duane came in and said "I've got two hours before I have to catch a plane, Ziggie, and I have to ask a favor." He wanted me to get hold of a piano and have it delivered to-and-so church and says, "You got any Martin Guitars?" I told him I have a whole batch of 'em, and he says, "I'm gonna give 'em to my friends for Christmas!" (Ziggie chuckles to himself) That's the kind of guy he is. Every once in awhile he'll do the same thing. He'll say, "I gotta friend that maybe like a guitar." And he'll buy it for him! DA: I imagine Duane has a pretty large collection of guitars. ZZ: Yes, he does. I think he's got about eight. DA: And the Gretsch was the only major brand you sold him? ZZ: Yeah. I suppose he'll hold on to that for the rest of his life. DA: Have any of Duane's friends shopped in your store? ZZ: I sold a guitar to Waylon Jennings 'bout two years ago. He was in town to do some recording and he called saying he wanted a good guitar and amp. When he came in later, I sold him a D-45 Martin..for about 1600. Funny thing, I heard later that Chet Atkins conned him out of it somehow. DA: How about amps? Ever sold any to Duane? ZZ: Oh, yeah. He's bought many, mostly Fender. I think he has 'em special made now, though. DA: Any of Duane's old band members -- the Rebels -- ever shop here? ZZ: Al Casey has. He bought two guitars from me. Both Gretsch. When he gets to Phoenix, he'll come and see me. He always likes to find something new. (He pauses, thinking) By the way , meant to tell you. One time Duane comes in here and bought some harmonicas off me. He bought the whole display. I said, "What the devil you gonna do with those?" He smiled right big and said, "I'm gonna be in an episode of HAVE GUN, WILL TRAVEL, and I have to learn to play harmonica for it." He was in it too. I saw it later on. He was sittin' under a tree or something and Paladin (Richard Boone) walked over to him. Yeah, I'll never forget that. He said, "I gotta learn to play this. I'm gonna be on HAVE GUN, WILL TRAVEL!" (laughs) I gotta big kick outa that! DA: You give guitar lessons here. Ever give any to Duane? ZZ: No, Al Casey's the man that really helped Duane with his playin'. DA: When was the last time you saw Duane? ZZ: Just last month (March). He'd been away...over to Europe, I think. He came in and sat right where you are and we had a nice talk. He said he was in town to visit his mom and dad and visit his fan club. Said he was gonna go to Nashville to do some recording. Told me when he comes back he's gonna bring me a picture he promised me. If you talk to him before I do, remind him, will you? DA: How about this? I'll come by when Duane's here next time and take a picture of you two together. ZZ: I'd like that fine. That'd be good. You know, I always liked Duane. He always treated me nice. He's one of the most polite men I've ever met. He's alway been polite; never brash; never wanted something for nothing. That says something for his up-bringing; his parants. There arne't many like him, especially in these times. He's always been a fine man.